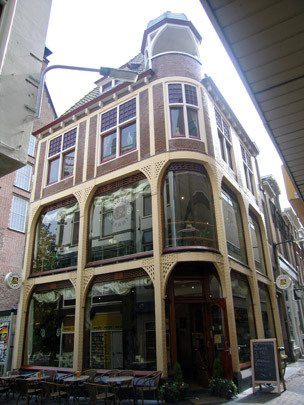 The architects Jesse and Fontein realized in quick succession this pair of Art Nouveau shops in the centre of Leiden. The cast-iron structural frame has been left exposed and the surface area glazed to the full so that the two buildings register as one large display window. The premises on Maarsmansteeg were intended for a seller of evening dress (Bruns & Ankerman) and have a dwelling on the second floor. What opaque areas there are consist of glazed brick and Swedish granite. Also worth remarking on are the gold-coloured roof tiles. The slightly more flamboyantly designed shop on Breestraat was home to a furniture business (Hasselman & Pander). Two brick corner towers frame the facade, whose lowest part is not the original.